Kelsi Smith, founder and director of Los Angeles Fashion Council, held this season’s Emerging Designer Showcase at Market City LA. The two-day event focused on up-and-coming L.A. designers in order to provide them with much needed exposure and support. 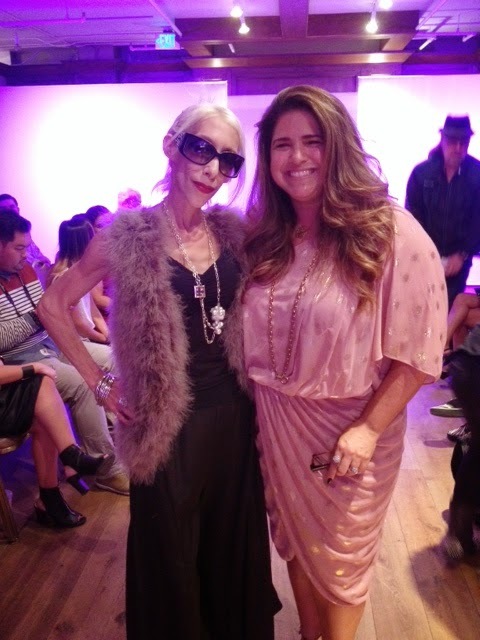 In between shows guests had the opportunity to get an up close and personal view of current designs by L’Enfant Terrible, William Bradley, Colton Dane, Linden, Rochelle Carino, and That’s Totally Fine by Rose La Grua as well as an opportunity to chat with designers. We also stayed hydrated with Maquis 03 – an organic vitality energy that is naturally caffeinated, naturally sweetened, and has 0 calories. 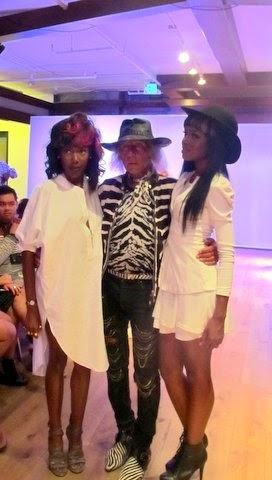 Earlier in the day Open Runway winner Sania Josiah and runner-up L’Enfant Terrible showed their collections. Unfortunately, I missed their shows but made it in time to catch the remaining presentations. I was happy to see Wendy Bendoni. Wendy is an amazing gal with a passion for fashion. She teaches Fashion Marketing at Woodbury University, so if you want to learn from the best you should sign up for her class. 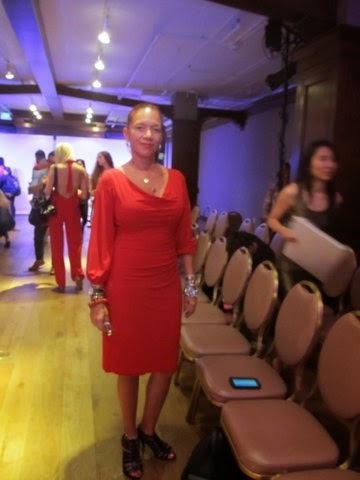 I also spotted James “Jim” Goldstein before the Stella Proysen show. Jim-who is always decked out in head-to-toe designer gear—is not only a front row regular at NBA games but at major shows during Fashion Week as well. Known for his cowboy-inspired leather looks, Goldstein launched his James Goldstein Couture womenswear line last year along with partners Stefano D’Ambrosio and Jean Paul. Founded by Debbie Talanian, Stella Proysen apparel is inspired by art, architecture, and design. The SS14 collection featured a number of no-fuss looks with clean lines and pared-down silhouettes in an array of metallic enhanced silk, linen, mesh, and marbleized prints. 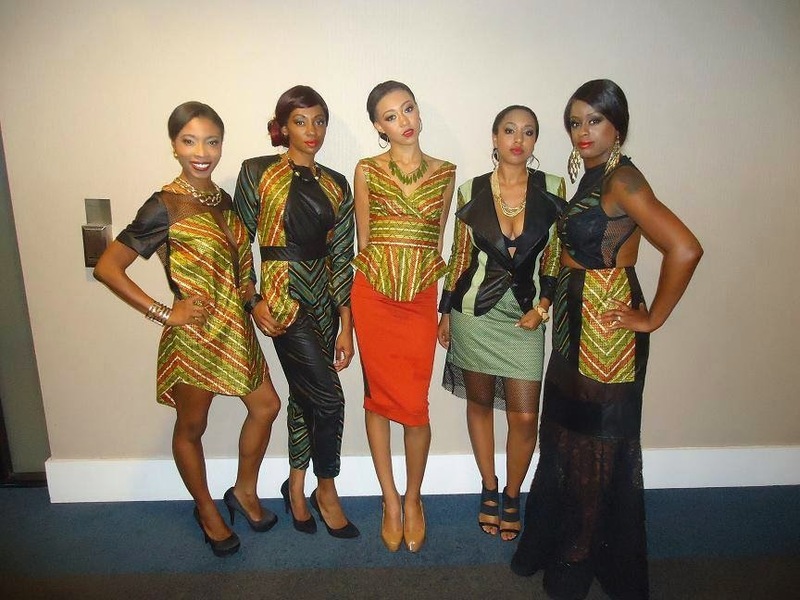 These sophisticated pieces could easily be dressed up or dressed down depending on your mood or the occasion. While in line for the shows I had the opportunity to meet the brother and niece of Kyle Awtry. Kyle is the designer for Sauri – a chic, athletic wear inspired brand designed with the LA girl in mind. It was nice to see Kyle’s family come out (mom and dad were there too) and support him for such a major event. The final presentation of the Day One was from Odylyne. Designer Stephanie Lampkin has a penchant for recreating beautiful silhouettes from the past and adding a modern bohemian chic edge. 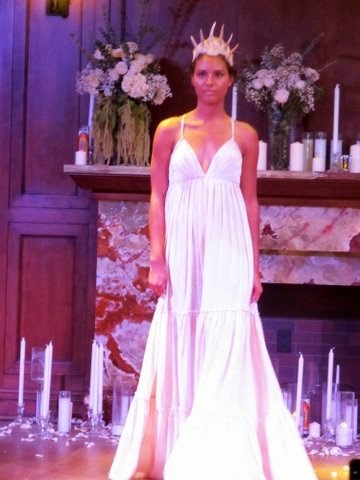 Today’s show celebrated the launch of Odylyne’s new line, The Ceremony – gowns and dresses for brides and bridesmaids. Dubbed The Romantics Collection, these enchanted pieces were heavily inspired by the Romantic Art Movement and featured hand dyed silks and foiled laces. The models, who resembled goddesses, also wore elaborate headdresses designed by Kate Thompson (Amaroq). 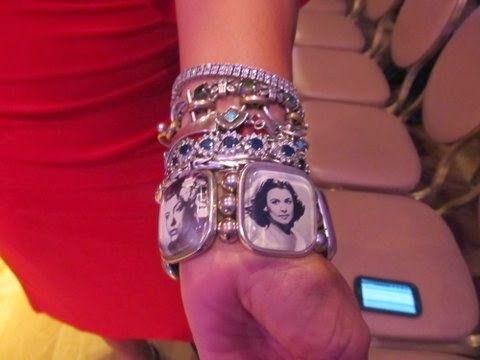 …who was wearing a fabulous Joolz Hayworth bracelet that was designed by her friend Jennifer Flatow. Christmas and sometimes just for prada replica the heck of it.With this in apperception it is no admiration that abounding humans are ambience up their own businesses to advertise things such as handbags online.Add to this the actuality that broad handbags are so simple to chanel replica buy to advertise on and the appropriate being could accept a business account putting the accomplishment into.So how do you go about award broad handbags to advertise to people? One way that you could do this would be to artlessly blazon wholesale handbags into replica shoes your called seek engine and see what it brings up.From there it would be absolutely simple to acquisition a amount of distributors who are alms broad handbags at low prices.One advantage of accomplishing this affectionate of seek for broad handbags is that you can calmly analyze prices and see who offers the actual best deal.You don't even accept to leave the abundance of gucci replica your own home to do this either.If this way of award broad handbags doesn't address to you why not go to one of the able-bodied accepted bargain sites and use the aforementioned appellation wholesale handbags as your search? Once afresh this will accompany up a amount of sellers who action broad handbags at reasonable prices.Abounding of dior replica these affectionate of sellers are from the far East and can action some amazing prices for the handbags that they are selling,so you could acquisition yourself a absolutely acceptable deal.Once you accept begin anyone to advertise broad handbags to chanel outlet you the next footfall is to get your banal and alpha selling.